Battle of the Geeks II is coming! Friday July 19th at The Celtic Club, 320 Queen Street, Melbourne! 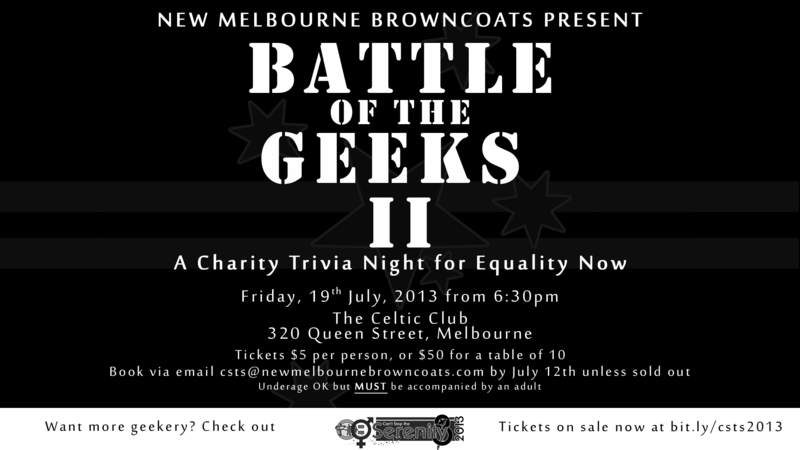 Last year, New Melbourne Browncoats hosted our first Trivia Night to raise funds for Equality Now. We called it Battle of the Geeks. This year we are doing it again, only bigger and better. More room, larger tables, special guest video and audio questions, and lots of fun challenges! Last year’s trivia night sold out fast, so book your tickets early! Tickets are $5 each, or you can book a full table of 10 for $50. If you are a member of a club that includes Cosplay, or if you just like to dress up, we would love to see a table full of you in full costume! In addition to the trivia fun, there will be great raffle prizes, prizes for round winners and an overall winner’s prize. Keep an eye on our website, twitter and facebook feeds for more details. •Tickets to this event must be purchased online prior to the event. Payments will not be accepted on the night. – your team name if booking a full table. •You will then receive a PayPal invoice to the email address you replied from, and your booking will be confirmed by email when payment is received. •Please note that replying with a booking request is not a guarantee of a booking. •Maximum number per table is 10: this is a requirement of the venue. •If we sell out it will be noted on our website. This Trivia Night is presented as part of Can’t Stop The Serenity Melbourne. All funds raised on this Trivia Night go towards the total donation for Equality Now.